The day shift for me began at 5:30 AM. Time to get up, get dressed and ready for the 6:00 briefing. In general the briefing proved useless. The people giving the briefings were based at the Javits center and had little idea what was going on at the WTC and by the time the briefing got to questions from the TFL’s it was time to head down to the WTC. Every TFL I talked to would have preferred to have ½ hour more sleep than go to a briefing. It also didn’t help that for the first 4 days they kept moving the times and places for breakfast. Hot showers did not arrive till the 4th day. When I got to the WTC site Steve Clendenin had informed me they had moved the cache again to make room for the heavy equipment that was cleaning debris off the deck. By Thursday morning our Structural Specialists had also arranged for the surveyors union to man the theodolites. This was an excellent move as we did not have to tie our people up on theodolite and the surveyors actually know how to use them. Instead of one theodolite looking at one spot from one location, the surveyors could monitor multiple points as well as move the theodolite if it was in the way and then set up again with the same accuracy. The Operating Engineers also brought more theodolites allowing more monitoring. 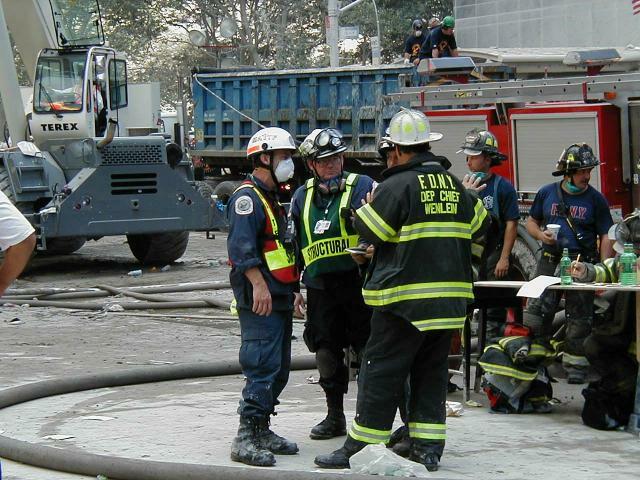 9/13, FDNY CP at Church and Dey, Chief Wenlein confers with MATF staff. This morning I also got a message that we were to begin to look for signs of depleted uranium. We now started paying attention to readings from our Geiger counters. As far as I know we never had an unusual level of radiation while we were there. I also never found out why anyone was looking for depleted uranium. Thursday morning I also got a call from the Javit’s Center that Fred Ellis’s (our night shift Haz-mat Technician) mother had passed away in Boston. Fred was at the Javits Center and after conferring with his family made the decision to stay at the WTC. I am glad as I think Fred’s mother would have wanted that way. Up till now we had no radio communications with the Javit’s Center. Charlie Dunne and Bill Yee and put up a repeater on the Western Union Building but even though we could hit the repeater from the WTC site the Base of Operations (BOO) in the Javit’s center could not hit the repeater from inside the building. All of the Task Forces had the same problem. Fortunately Charlie Dunne was doing some antenna work on the roof of the Javits Center when he noticed he could hear the people at the WTC on his hand held radio. He then erected a base station on the roof of the Javits Center with a highly directional antenna pointed at the WTC and remoted the base station using an old handset remote and a pair of phone lines from the building services people. By Thursday morning we had a working radio connection between the BOO and the WTC. Over the next few days the other Task Forces would copy this setup and eventually tie the BOO to the WTC. At 1:59 PM on Thursday all of the work in the Church Street Sector stopped briefly as the Stars and Stripes were raised on one of the damaged flagpoles in front of building 4. That afternoon I met up with the TFL from the Riverside, CA Task Force. He had been assigned to the Liberty Sector, which was on our left. We had been sending our canines over to that sector and I though it would present a good opportunity for his Task Force. We both walked over to Liberty Street and looked for various options as to where to put his recently arrived Task Force. The best place we could find was the sidewalk next to the Engine 10 Ladder 10 (10-10) fire station. Rich Parker was with me and he arranged to have a front-end loader clear the sidewalk nest to the 10-10 station. It should be noted that the street and sidewalk next to the 10-10 fire station was the only source on entrance and egress from the entire Liberty Sector. 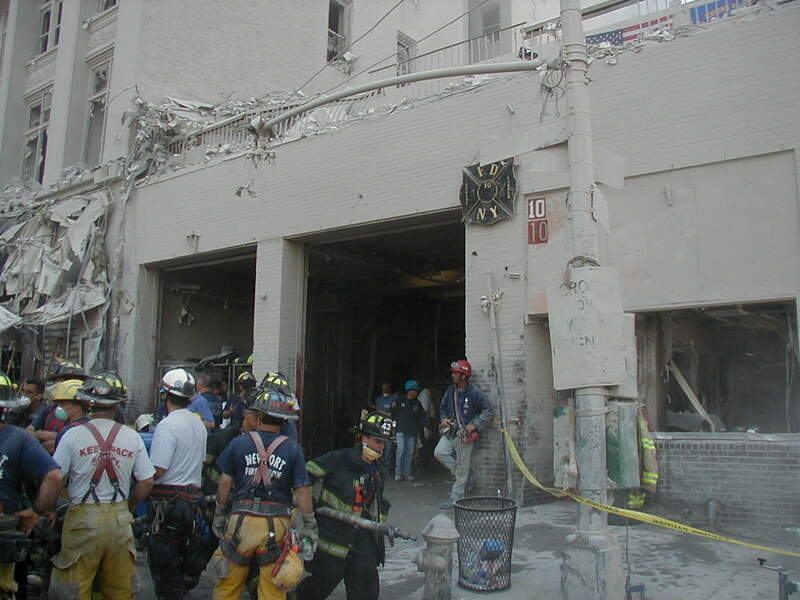 This was due to the fact that the overhead walkway from WTC 2 to One Financial had collapsed on Liberty Street, preventing anyone from traveling west and forcing them down Greenwich Street. 10-10 station at Liberty and Greenwich, a little too scary for the CA TF. Finally Rich Parker and the front end loader got the sidewalk cleared nest to 10-10 and the first truck from Riverside arrived with a load of Riverside Task Force member on their first visit to the WTC site. They had carefully unloaded about one half of the truck when someone sounded the evacuation signal and about 2 thousand scared people came running down Liberty Street and took a left on Greenwich Street totally overrunning the Riverside TF. Nice welcome to the WTC I thought. That night I went back to see how Riverside was making out, and could not find the Task Force. Their planning people had determined the sidewalk are to be too dangerous and moved them to a parking garage three blacks away. 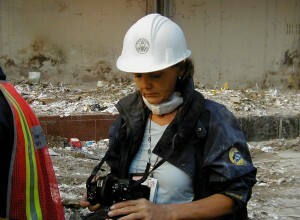 It was on the 13th that we were visited by FEMA photographer Andrea Booher. She had had some issues with access to various portions of the pile and I assigned Rich Parker to make sure she had whatever access she needed. Andrea was able to take some very dramatic photos of our team and the FDNY personnel working on the pile. We began receiving weather reports that tonight was going to have periods of heavy rain. The New York Department of Corrections erected a tent over our cache and we also brought in one of our large Army TEMPER tents for the rest of the cache. In addition to erecting tents for the night we had to relocate the cache one more time.